Blade length : 66.4 cm or 26.14 inches. Kasane : 0.6 cm or0.23 inches. Era : Edo period aroud Kanbun era. Shape : Regular width and thicness Katana. The Jigane is beautiful blackish Jigane. Hamon : Nie Deki, Gunome Midare with thick Nioikuchi ad Ashi. The Habuchi is soft. In Ha, there are Sunagashi and Kinsuji. Boshi : round Yakisage style. the great first generation Yasutsugu who was called Siro uemon. After his brother died, he became Echizen. The blade looks like the works of the 2nd generation, having nice Jigane. 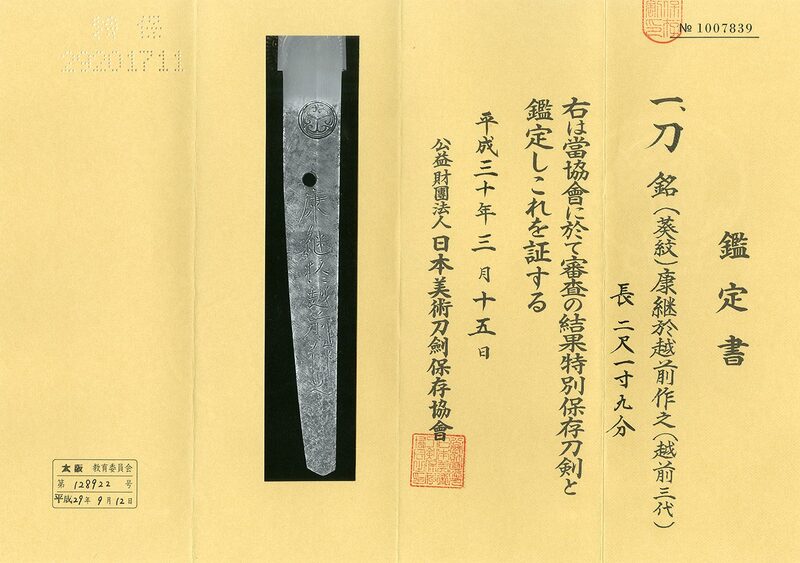 Syogun Takugawa family permitted him to engrave Tokugawa family’s crests （aoi family crest) on the tang of the swords. Tsuba : Round iron Tsuba, samurai are engraved with gold color.the signature can read Esyu hikoe ju. Fuchigashira : Syakudo-nanakoji, Samurai engraving. NBTHK Hozon Tokubetsu hozon paper.